Kotlin vs Java: Which is best Programming language for Android Development? One of the most trending questions popping up these days is regarding the differentiation between kotlin web development and java apps development. Java is used to write Android applications and can run on Java virtual machine (JVM). Kotlin is also a JVM suitable programming language that assembles Java byte code and has been a center of attraction for Android platforms. Kotlin was initially brought in by JetBrains in the year 2011, who is the developer of PyCham, IntelliJ IDEA, and another premium IDE’s. The Kotlin is named after “Kotlin Island” in St. Peters burg, Russia. Initially, Kotlin was developed to be better than Java in every possible manner, but JetBrains didn’t create a completely fresh IED’s for it and this is the sole reason as to why Kotlin was created cent percent interoperable with Java. One can easily doodle Kotlin with Java. Kotlin is a statically typed language which was developed by JetBrains. Kotlin does not demand much while translating current Java codes; it exists with a single click tool. One of the remarkable characteristics of Kotlin programming language is the depth of its interoperability with Java, which seeks more Java compilers to learn Kotlin. It functions in the JVM and makes use of Java tools and libraries. It provides backward compatibility for version 6 and 7 of Java. The characteristic scope and importance of a class is always a hot topic among programming language developers. A usual data class in Java has various boilerplate code which requires to be skipped while figuring out an authentic application of that class. Although in Kotlin you can draft the equivalent of the similar Java code in a very easy way and secures tons of mental and typing attempts. The default parameter present in Kotlin is very useful. The benefits of this can be seen in context with the functionality of various alternative parameters. The standard Kotlin library does not consist of any kind of garbage. It is compact and small. It generally pays attention to extensions of Java standard library. Most of its functions are inline-only which inline code becomes. Kotlin has various optimizations, which particularly helps in the development of Androids. making any alterations to their source code. Kotlin will support in reducing jotting down of codes. As in Java, the entire code is to be written, Kotlin compiler can comprehend from the code and draft the leftover codes. Kotlin has a lot of resistance to the development of Android. Yet it is also utilized in backend assignments such as Spring 5. Changing from Java to Kotlin is quite simple. All that needs to be done is installed the Kotlin plugin and include it in Gradle build files and click on “convert” option. Kotlin consists of smart extension feature to aid developers in developing clean APIs. Comes with Null type system- nullability problems are very general in Java and as Android makes use of null to offer the absence of the value, Kotlin resolves it by placing null directly in the type mechanism. Kotlin is briefer than Java which implies fewer amounts of chances of bugs and mistakes. Fresh modules can be drafted, and they will swiftly function along with all Java libraries and framework, the JVM and can compile with the Maven or Gradle build mechanism or grade. No expenses occur for developing and adopting Kotlin, except for the fees of training and learning. In place of a steep learning curve while converting whole teams to Kotlin because of the brief syntax of the language. The slow speed of compilation in comparison with Java. A limited number of developers of Kotlin which implies restricted learning resources and finding it hard to figure out answers to questions. Kotlin developers which are well experienced are rare to be found, so searching a guide for your squad members might be a difficult task. The autocomplete and assemble features of Android studio is that it posses to function slowly. Inline functions along with Lambda expression makes ideal performing custom management structures. Java for Android is very popular among developers for android app development as Android was written in Java. Advanced by Sun Microsystems, Java is known to be an object-oriented programming language that brags the subject of the 2nd most active language by GitHub. Ever since its development, it is gaining popularity. For Java, object means everything. Java can be simply expanded as it has an Object model. Java is developed in such a manner that it is simple to learn. If an individual comprehends the primary concepts of OOP Java, it would be quite easier for them to master the language. Due to the protection feature of Java, it permits the development of a mechanism which is free from temper and virus. Authentication tricks depend on public key encryption. Developers of Java made an architecture-neutral object file format, which makes the code assemble quite easy and executable on most of the processors with the help of Java run time mechanism. Java is not assembled into platforms for specific machines. Platform-independent byte side is used by Java. This byte code is spread over the internet and comprehended by Virtual Machine (JVM) on the platform it functions on. Java is considered to be portable as it is architecture-neutral and does not have any implementation-dependent factor of the specifications. Assembling in Java is done in ANSI C with a clear portable boundary that is POSIX subset. Java strives to get rid of bug-prone circumstances by stressing closely on checking of assembling error and run time. With the characteristic of Multithreaded, it is possible for Java to draft programs which are multifunctional. This pattern characteristic permits the developers to make interactive apps which functions swiftly. Java byte code is decoded on the fly to native machines codes and is not stored anywhere else. The process of development is quick and analytical as the linking is a light-weight as well as an incremental procedure. With the help of Just-In-Time compilers, Java offers top-notch performance. Java is drafted for the distributed environment of the web. Java is accounted to be more effective than other languages such as C or C++ as it is crafted to adapt to ever-changing situations. Java programs can run an extensive amount of run time data that can be utilized to uphold and fix accesses to objects during run time. Simple to learn and comprehend. Versatile, one can easily run it in a virtual machine and browser window. This is convenient while reusing code and updating software. An excellent alternative for cross-platform applications. Android counts on Java for its functions. The Android SDK includes most of the standard Java libraries. Java has a huge open source eco-mechanism, because of Google’s endorsement with Java Virtual Machine (JVM) for Android platforms. Boosts up assembly within Gadle. Java has a stunning feature of assembling huge assignments within no time. The compactness of Java apps is unbeatable. In contrast to Kotlin, Java apps possess to be lighter even in complete analog. A Kotlin application which includes complicated computing procedures in its codes which tends to work slowly on user services with low technical specifications whereas Java resolves this issue. Top speed of development, Java makes sure rapid development procedures than Kotlin. One of the greatest demerits of Java is that it causes issues with the Android API pattern. As it is a verbose language, larger codes are required by Java which comes with larger uncertainties of mistakes and bugs. The speed of Java is much slower than most of the other languages and needs a lot of storage capacity. New Pope (YouTube frontend for Android platforms). Android-oss (official kick starter Android application). WordPress Engineering (formal WordPress Application for Android). There are various reasons to give preference to Kotlin on Java but in most of the scenarios, Java tends to have an upper hand. Out of the two, it is very difficult to ascertain which one is the best alternative and will yield better outcomes. There are various circumstances where procedural programming language is effective, whereas procedural programming language can simultaneously be utilized in other places. Kotlin combines procedural as well as a functional approach and strives to offer excellent services from the two. As the experience of Java app development is acquired, the comprehension and expansion of Kotlin naturally sneak in. 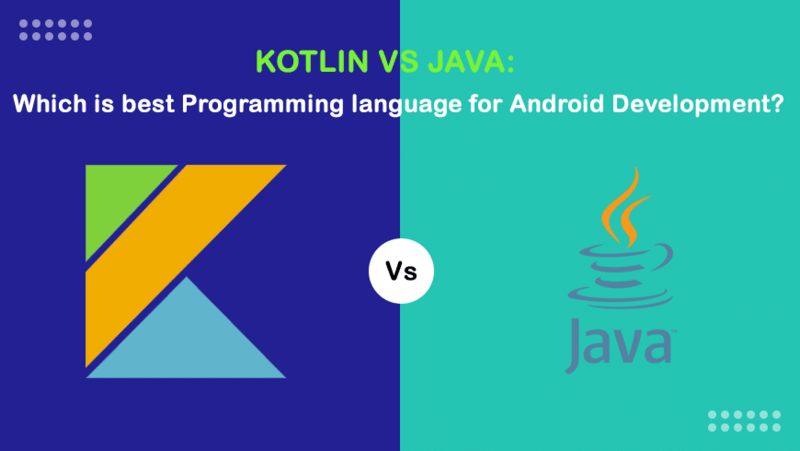 The hot topic of kotlin vs java as android development language will likely to not settle in the near future, as both of them has their own set of advantages and disadvantages. The choice is completely up to the user whether they want to opt for Kotlin or feel that Java is the best possible alternative for best android development.